The ultrasound technique that we propose is based on the analysis of the frequency (spectral) content of signals backscattered by blood, which are related to the blood microstructure. This technique consists in fitting the measured frequency dependent backscatter coefficient to an estimated backscatter coefficient using an appropriate theoretical scattering model. Recently, the theoretical model named the Effective Medium Theory combined with the Structure Factor Model (EMTSFM) developed by our group was found to be more suitable than other classical scattering models (such as Structure Factor Size Estimator, Spherical Gaussian model). The ultrasound technique was tested in vitro on porcine blood sheared in the Couette instrument and a tube flow system. The difficulty in applying this technique in vivo is due to the frequency-dependent attenuation caused by intervening tissue layers that distorts the spectral content of backscattering properties from blood microstructures. To correctly evaluate microstructural parameters, it is thus of major interest to take into account tissue attenuation effects. 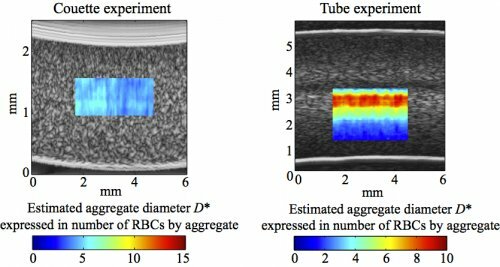 An optimization method, called the Structure Factor Size and Attenuation Estimator (SFSAE) was proposed to simultaneously estimate tissue attenuation and erythrocyte aggregate structure.